John Wayles Eppes was born on 19 April 1773 at Eppington, Chesterfield Co., VA. He married Mary Jefferson, daughter of President Thomas Jefferson and Martha Wayles, on 13 October 1797. John Wayles Eppes owned as a slave Betsy Hemmings, daughter of Mary Hemmings. John Wayles Eppes died on 13 September 1823 at Milbrook, Buckingham Co., VA, at age 50. Among wedding presents from Thomas Jefferson was the 14-year-old slave Betsy Hemmings (who may have been Jefferson's illegitimate daughter). Betsy Hemmings is recorded as being the nurse of John's son Francis. When Betsy had a daughter by Eppes the child was named Frances. Eppes was interred in the private cemetery of the Eppes family at Millbrook, near Curdsville, VA. When Betsy Hemmings died in 1857 she was buried next to Eppes's grave with an elaborate stone. Patsy Eppes died at Millbrook in 1862 and ws buried at her daughter's home in nearby Chellowe instead of beside her husband at Millbrook. Anecdotal evidence suggests that Patsy Eppes would not be buried near her husband's mistress. [S182] Social Security Death Index (on-line), Ancestry.com, SSDI, Ancestry.com, SSAN 272-05-1106. Benjamin Franklin Randolph was born on 16 July 1808.1 He was the son of Thomas Mann Randolph Jr. and Martha Jefferson. [S679] William H. Gaines Jr., Thomas Mann Randolph, page 71. Dewey Leo Eaken was born on 20 January 1899 at Lafayette, Medina Co., OH. He married Velva Cleo Wightman, daughter of Otto Leon Wightman and Mertie Lura Fosier, on 24 December 1921 at Medina Co., OH.1 Dewey Leo Eaken died on 8 June 1960 at Medina, Medina Co., OH, at age 61. [S681] MR: Eaken and Wightman. [S182] Social Security Death Index (on-line), Ancestry.com, SSDI, Ancestry.com, SSAN 272-28-4619. James Madison Randolph was born on 17 January 1806 at Executive Mansion, Washington, DC. He was the son of Thomas Mann Randolph Jr. and Martha Jefferson. James Madison Randolph died in 1834. Meriwether Lewis Randolph was born in 1810. He was the son of Thomas Mann Randolph Jr. and Martha Jefferson. Meriwether Lewis Randolph died in 1837. George Wythe Randolph was born on 10 April 1818 at Monticello, Albemarle Co., VA.1 He was the son of Thomas Mann Randolph Jr. and Martha Jefferson. George Wythe Randolph married Mary Elizabeth Adams on 10 April 1852. George Wythe Randolph died on 3 April 1867 at age 48. He was buried at Monticello, Albemarle Co., VA.
George was a lawyer and the Confederate States Secretary of War during the American Civil War. He was also Thomas Jefferson's grandson. Named in honor of George Wythe (a signer of the Declaration of Independence), he was a relative of Edmund Randolph, who served in George Washington's cabinet as the first Attorney General of the United States, as well as colonist William Randolph through both his mother and father's sides of the family. Randolph briefly attended school in Cambridge, Massachusetts, and served as a midshipman in the United States Navy. He attended the University of Virginia before moving to Richmond and becoming a lawyer. As the Confederacy was established and the United States divided into two hostile camps, both sides moved steadily toward open conflict. A special delegation, composed of Randolph, William B. Preston and Alexander H.H. Stuart, travelled to Washington, D.C. where they met President Abraham Lincoln on April 12, 1861. Finding the President firm in his resolve to hold the Federal forts then in the South, the three men returned to Richmond, Virginia on April 15. He joined the Confederate army, serving as a major in the Battle of Big Bethel, and was promoted to brigadier general on February 12, 1862. 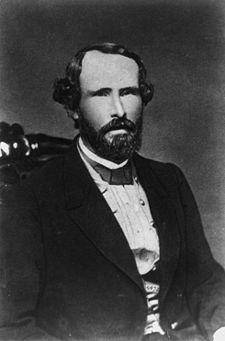 Randolph was appointed by Jefferson Davis as Secretary of War on March 18, 1862, and he took office on March 24, 1862, but resigned on November 17, 1862. Randolph chose exile in Europe after the Confederacy fell. He later returned to Virginia where he died two years later in 1867 from pneumonia. He is pictured on the $100.00 bill of the Confederate States of America. [S679] William H. Gaines Jr., Thomas Mann Randolph, page 104. Caleb is mentioned in Harvey’s History of Wilkes-Barre. He was one of the earliest settlers of Westmoreland County, Connecticut (now Luzerne County, Pennsylvania). He came there under the auspices of the Connecticut Susquehanna Company that was formed in 1753 after the purchase of the Wyoming Valley from the Iroquois Indians. The first settlement of the Wyoming Valley was made in the spring of 1762. Caleb first appeared on a list of inhabitant in 1771 and in 1772 he owned four lots in Wilkes-Barre. In 1775 he was appointed to the Committee of Inspection for the town of Westmoreland. In 1776 Caleb was listed on a Hanover Township tax list. In 1778 Caleb was a private in the Westmoreland Militia, part of the 24th Connecticut. His son, Walter Spencer and his son- in-law, Richard Inman, also belonged to the regiment. During the Revolution the Wyoming Valley was the scene of the Wyoming Valley Massacre. Most of the able-bodied men had joined the Continental Army. A force of about 300 old men and boys, at Forty-Fort, made up the Valley’s defenses. Forty-Fort was so named because it had been built by 40 of the Connecticut settlers. On 3 July 1778 they were attacked by Butler’s Rangers, a detachment of Sir John Johnson’s Royal Greens and a force of 700 Seneca and Cayuga Indians. At first charge the Fort surrendered. Two-thirds of the defenders were slain in battle and the Indians tortured many of the survivors, who had surrendered. Among those killed were Josiah, (his sister Esther Spencer married Major John Garrett), James and Levi Spencer. Caleb, Walter and Edward Spencer survived the battle. In 1779 Caleb Spencer inventoried the estate of Elisha Inman, Jr. (slain in battle and brother of Caleb’s son-in-law, Richard Inman.) Hannah Spencer died of smallpox at Wilkes-Barre in the spring of 1779, age 55. Caleb was named on a militia payroll in 1780 and on the Bill of Losses; he was listed as having lost 182 pounds. The 1781 poll tax for the town of Westmoreland listed Caleb with four horses and one head of cattle and the tax owed was in excess of 40 pounds. The Wyoming Valley was fertile and with rich deposits of coal. For 30 years it was an object of dispute between Pennsylvania and Connecticut (the Pennamite Wars). On 30 September 1788 Caleb conveyed to his son, Walter, (both of Hanover Township) lot 20 in Hanover for 300 pounds. For 40 pounds he conveyed Lot 7 in Hanover to his son-in-law, Richard Inman. In 1789 Caleb Spencer, yeoman, conveyed to Hugh Conners, for 18 pounds, town lot 44 in Wilkes-Barre consisting of three-quarters acre. Caleb may have died accompanying his son, Walter, to Kentucky. Mary Carter married George Braxton Jr.1 Mary Carter was born in 1712. She was the daughter of Robert Carter and Elizabeth Landon. Mary Carter died in 1736. Child of Mary Carter and George Braxton Jr.
Benjamin Lamphier was born circa 1868 at NY. He married Mertie Lura Fosier, daughter of Lyman Fosier and Mary Augusta Holcombe, in 1891. Benjamin Lamphier died circa 1896 at Wellington, Lorain Co., OH. Mary Randolph was born in 1692.1 She was the daughter of William Randolph and Mary Isham.1 Mary Randolph married Capt John Stith. John Randolph was born on 11 September 1779 at VA. He was the son of Col. Thomas Mann Randolph and Anne Cary. Alexander Burnett McWhorter was born on 22 January 1862 at Cross Keys, AL. He was the son of Major Eliphalet Ariel McWhorter and Anna Gore Shepherd. Alexander Burnett McWhorter died on 26 August 1900 at St. Marys, Camden Co., GA, at age 38. He was buried at Oak Grove Cemetery, St. Marys, Camden Co., GA.
Mary Isham Randolph was the daughter of Thomas Randolph and Judith Fleming.1 Mary Isham Randolph married James Keith on 28 April 1754 at Fauquier Co., VA.
Otto Leon Wightman was born circa 1857 at Lafayette, Medina Co., OH. He married Mertie Lura Fosier, daughter of Lyman Fosier and Mary Augusta Holcombe, on 24 June 1897. Otto Leon Wightman died on 23 April 1918 at Lafayette, Medina Co., OH. Elizabeth Beverley was born on 1 January 1691. She married Col. William Randolph II, son of William Randolph and Mary Isham, on 22 June 1709.1 Elizabeth Beverley died on 26 December 1723 at age 32. Lyman Fosier was also known as Lyman Mosier. He was born circa 1857 at NY. He married Mary Augusta Holcombe, daughter of Nahum Holcombe and Matilda Hastings. George Harry Eaken was born on 17 December 1922 at Medina Co., OH. He was the son of Dewey Leo Eaken and Velva Cleo Wightman. George Harry Eaken died on 19 December 1922 at Medina Co., OH. Elizabeth Lightfoot married Beverley Randolph, son of Col. William Randolph II and Elizabeth Beverley, on 22 December 1737. [S689] Jonathan Daniels, Randolphs of Virginia, page 57. 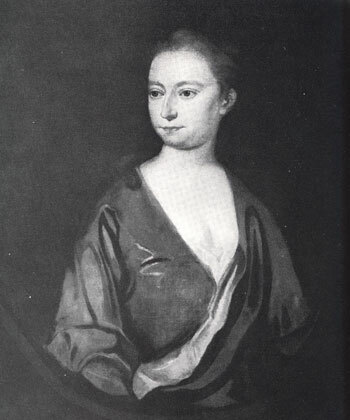 Anne Harrison was the daughter of Benjamin Harrison IV and Anne Carter.1 Anne Harrison married William Randolph, son of Col. William Randolph II and Elizabeth Beverley, in 1735. George Washington Randolph was born on 19 December 1781 at Tuckahoe Plantation, Goochland Co., VA. He was the son of Col. Thomas Mann Randolph and Anne Cary. Archibald Cary Randolph was born on 24 August 1771 at Tuckahoe Plantation, Goochland Co., VA. He was the son of Col. Thomas Mann Randolph and Anne Cary. In a discussion that will probably never end, there are specific differences between genealogy and history. Genealogy is concerned with provable dates and places; whereas history accepts what is probable. 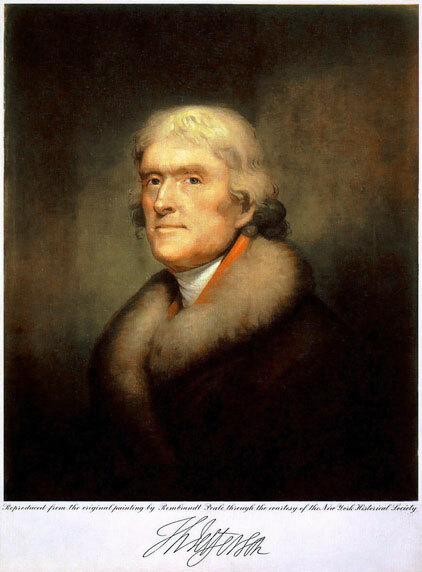 It is not surprising, therefore, that genealogists do not accept the children of Sally Hemmings as descendants of Thomas Jefferson, whereas historians seem now to acknowledge it without question. However, genealogists are slowly accepting DNA as proof of some relationships, and may yet accept the Hemmings family, but this situation is a textbook example of why DNA is not yet accepted by genealogists: there are multiple males in the Jefferson family that could have fathered her children. It is probabaly history that will provide the final proofs necessary as other male candidates are eventually eliminated. The latest book that attempts this is Annette Gordon-Reed's second on the subject, The Hemingses of Monticello. I will attempt to list the Hemmings family under Sally's listing without making the final "genealogical" connection to Thomas Jefferson.